The Dalmian Community Project: Reaching out to Tribal village – Osarvira, Palghar District. Student Research – Conference by the students, for the students. Learning by doing: Reaching out to NGOs – Old Age Home, Orphanage, Special Homes, etc. Revision lectures for FYBCom and Preliminary Examination for TYBCom students. GUIDANCE workshops for NET/SLET Aspirants. Disseminating Information the E -Way : The library uses Current Awareness Service using advanced ICT tools like Whatsapp & Facebook. The Goal of the above practice is to keep the readers updated about New Arrivals in the Library. New books are added regularly in the Library. To keep the faculty members aware about the New Books added in the Library, mobile application Whatsapp is used to send the images of New Arrivals in the Library. Bulleting group ‘Library bulletin’ is created using Whatsapp. From time to time New arrivals are posted in the group. To keep the students abreast about New Arrivals. Images of Jackets of New books are posted on the Official Facebook page of college regularly. Quality Circle: A group of students was formed as the Quality Circle that functioned as the logistic support group of the IQAC. Data collection related the Feedback, raw data analysis, file compilation, typing of formats, etc. was handled by the Quality Circle throughout the year. Fare Forward – The IQAC Newsletter is published with the support of the Student Quality Circle; it is through this newsletter that the Internal Quality Assurance Cell disseminates news of its activities to its stakeholders every six months. The Newsletter is available on the college website. Student Research Cell: The Student Research Cell organizes conferences and seminars for the students. This is a group of students who under the guidance of teachers engage in research activities. 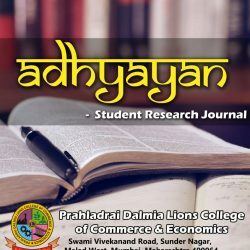 Addhyan , the Students Research Journal is the outcome of the activities of the Studnets Research Cell. Student Managers Committee: Student Manager Committee in 2016-17 aimed to inculcate event management skills in students. SM Committee comprised of three heads along with 6 Departments – Accounting & Documentation, Logistics & Decoration, Photography, Hosting, Public Relations and Information Technology. The SMC consisted of total 81 student members and a teacher in-charge. They were given the charge of organizing several events for the students and administrative staff of the college. They handled their responsibility with great alacrity. All Activities conducted under the Theme of the year: Every year a theme is chosen and all activities are conducted accordingly. Organization of Seminars and Conferences: Enriching the academic atmosphere is the priority. Therefore a number of seminars, conferences, workshops for teachers, students and administrative staff are conducted throughout the academic year. Orientation Programme: The parents and students are introduced and inducted into the culture of the institution at the entry level. Using the PDCA Cycle for the all activities: All activities follow the PDCA Cycle – Plan . . . Do. . Check…. Act. Facilitation of planning of all Departmental activities is initiated and its implementation is kept under regular check and control. All documents used in the institution are formatted in accordance with the requirements of ISO 9001:2015. Internal Audit by trained Auditors: Regular Internal Audit is conducted by a team of selected Senior members – 20 – of the Teaching and administrative staff who were given a formal Training of Internal Auditors and certified accordingly as per the norms of ISO 9001:2015.